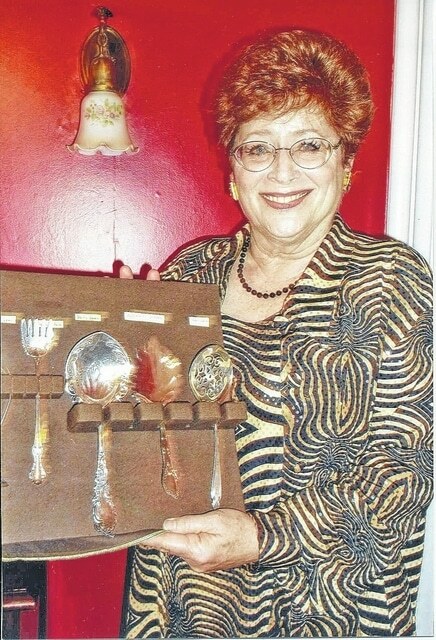 Pat Lawrence spoke about Victorian silver flatware at the June meeting of the Hillsboro Woman’s Club. Here, she displays some of the pieces she brought to the meeting. Pat Lawrence of Hillsboro was the guest speaker at the June 9 meeting of the Hillsboro Woman’s Club, which met at the Senior Center for their last luncheon and meeting before the club’s usual summer hiatus. They will meet again in September. Lawrence fascinated her audience with her knowledge of Victorian silver flatware and brought several items to display and often to explain their purpose. The Victorian Era – the period from 1837 to 1901 – marked the length of the rule of Great Britain’s Queen Victoria. Victorianism was an offshoot of this period and lifestyle that occurred in the United States, chiefly in heavily populated areas such as New England and the Deep South. Lawrence was assisted by Nancy Sullivan of Belfast. According to Lawrence’s research, silver flatware was made to serve every type of food and guests were expected to know which piece was intended for what course. At that time, it was not unusual to serve from three to nine meat dishes alone, plus all the appropriate accompaniments. Dining lasted from two to five hours and fish was always a part of a meal – even for breakfast. There were no finger food in those days. There was a Terrapin fork for turtle, and cheeses had many utensils, such as forks, knives, spoons and scoops. There were scoops for crackers and chips. Berries and fruits called for several different kinds of servers. Since ice cream at that time was sliced, there was an ice cream shovel. There were medicine spoons which had funnels, and even a half-teaspoon, which resembled an ordinary teaspoon which had been cut down the middle of the bowl. A croquet server was not for a game which was played in the yard, but to serve a food, which might be called a croquette today. Today, guests are told to start a meal with the silverware that is the furthest from the dinner plate and work inward toward the plate. In the Victorian era, footmen stood at each side of the table to provide the appropriate item. If all the silverware was displayed at each place setting, it might have taken three or four feet of table space for each person. Originally silver pieces were made by hand. Paul Revere was said to have 100 hammers and 50 different anvils. John Gorham was a prominent silver maker after the Civil War. During the Great Depression, which began on Oct. 24, 1929, and lasted six years, much silverware was melted for its metal value. Much silver was also sold in the 1980s when silver was at a very high price. After this extremely interesting program, president Mary Todd Hardeman conducted a brief business meeting, with Fran Larkin’s treasurer’s report filed for audit, and Gretchen Huffman’s secretary’s minutes of the last meeting approved as read. In new business, three active members submitted requests to have their membership status changed from active to associate. They were approved.